Il Rosolaccio disposes of 6 double rooms of approximately 20-30 m2, each with private bathrom and shower. 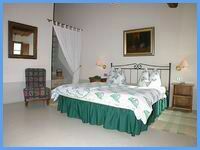 The rooms have wooden beam and mezzana ceilings and are furnished in a pleasant Tuscan manner. In the morning, a rich breakfast buffet is served between 8.30 and 9.30 in the breakfast room or during the summer months on the terrace. In the evening it is possible to book a complete Tuscan dinner based on meat or fish, served in the restaurant or on the terrace. Upon request it is possible to prepare a vegetarian menu.